Let's face it, not many kids get excited about completing a page of 30 math problems all of the same type, on a bland piece of paper. It's uninspiring, monotonous, and actually gets kids annoyed with math. That's hardly the feeling we want students to have when it comes time to practice and keep their math skills sharp. Since standardized tests, and particularly state exams, assess children on all different types of math problems, why not get them practicing with review worksheets that do the very same thing? Where Reviewing Math is Fun! What are the 10 Quickies math review worksheets? 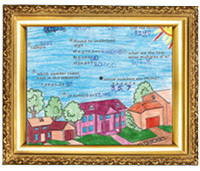 Designed as a review of math material already covered, 10 Quickies are half-page worksheets that include ten grade level math problems woven into an original, one-of-a-kind illustration. One of the main reasons why kids fall in love with the 10 Quickies worksheets is because they don't know what the next scene will be. A wondrous carnival? A relaxing beach? 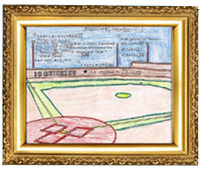 A baseball field? A view from space? The mystery is what generates the excitement and that's what helps make 10 Quickies so effective! Here's your chance to take the monotony out of reviewing math and get your students inspired to practice at the same time! It's also important to realize you don't need to be a teacher in order to use the 10 Quickies math review worksheets! * Parents * - this is an easy way for you to provide an opportunity for your child to review grade level math right at home! If you have a child in 2nd, 3rd, 4th, or 5th grade, get 4 FREE samples right here so you can find out right away what your kids think. How are 10 Quickies Math Review Worksheets Organized? When designing the 10 Quickies series, we used the math quarterly pacing plan from the Los Angeles Unified School District that are directly tied to the California instructional standards. Since the 10 Quickies math review worksheets are designed in sequential order, the problems on each handout will review content more or less in the same order in which it is taught per grade level. This is an easy way to help your students master math on an automatistic level and give them an edge when it comes time to test. 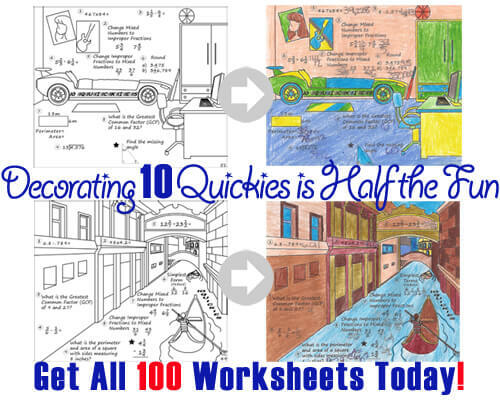 "The 10 Quickies worksheets are a fantastic resource that can be put to immediate use with practically no prep time!" If you are a teacher, math coach, administrator, or parent from a different district/state/country and would like to see what's covered in the 10 Quickies math review series, click here for the complete list of educational standards. We now have the 2nd, 3rd, 4th, and 5th grade series available each with a total of 100 original, one-of-a-kind 10 Quickies math review worksheets you can photocopy and hand out to your students. Within the 100 worksheets are 10 illustrations without problems allowing you to make your own personalized 10 Quickies so you can have your students focus on particular concepts or standards they need to practice. You can even make it a reward or class competition to see who gets to create their own 10 Quickies math handout everyone completes. Imagine the enthusiasm you'll get towards math in your classroom with that contest! Don't miss out on this valuable resource that will get your students actively engaged and excited about reviewing math. For only $7.95 there's no reason why you shouldn't get your hands on the entire 10 Quickies math review series of your grade level choice right now. That's less than 8 cents per worksheet! Simply click the link below and in minutes you will have a whole new set of math review worksheets in your hands. 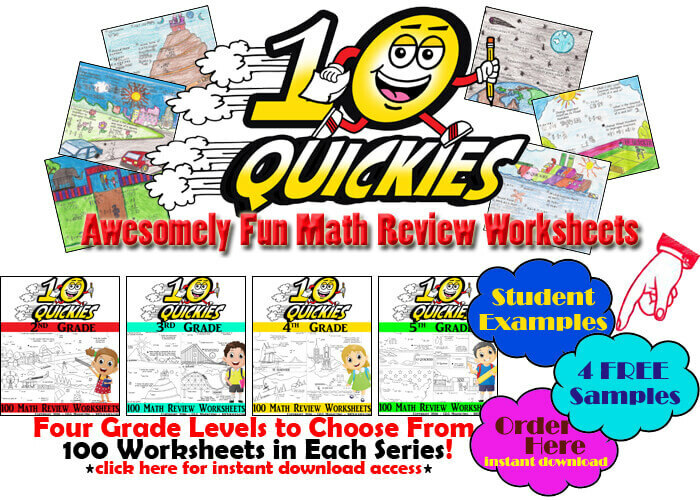 "I am astonished at how much my students enjoy the 10 Quickies math review worksheets. Many of them have saved all 50+ that we've done already. It's literally the perfect review for grade level content!" "My 4th grade students love these 10 Quickies math worksheets. Better yet, I get to immediately find out exactly which standard each student has mastered and those they are still having trouble with." "We have been using 10 Quickies for two months now and my students love them! Thank you for creating such a helpful math resource that's so easy to use." "My students LOVE their 10 Quickies! It's so fun to see their enthusiasm towards reviewing math standards that we've learned." "Our math time often starts off with 10 Quickies. Takes only about ten minutes and transitions my students nicely into our math lesson."